They insist that they be allowed to express themselves, above all else, in Tsotsil and as Tsotsiles. As outlined in the controversial fall 2013 editorial from n +1, concepts of “World Literature” or “Global Literature” in translation are continually haunted by circuits of colonial power. Must we begin with Goethe and his Weltliteratur? Must translation practices always be subject to market forces and so dominated by economically powerful languages like English? What is the role of individual multilingual readers who communicate in multiple languages? These questions become all the more pressing in the cases of so-called minoritized languages. Possessing limited access to education and formal literary training within their respective nation states, minorizited languages are by definition disadvantaged with regard to publication and the dissemination within their respective national confines. Indeed, whether the context is the United States, China, or Colombia, despite the tireless activities of linguistic activists, one of the overriding concerns of publication in minoritized languages is who, exactly, constitutes the audience for a text that, more often than not, will be accompanied by a translation into the dominant language anyway? 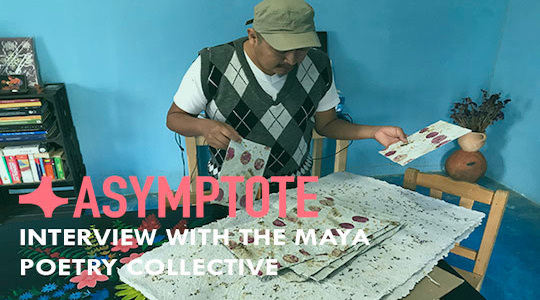 These are a few of the topics that came up in conversation with the San Cristobal de las Casas, Chiapas, Mexico, Tsotsil Maya literary collective Snichimal Vayuchil (“The Flowery Dream”) when I sat down with a few of its members recently. Consider, for a moment, the untranslatability of the group’s name. What sounds like an overwrought cliché in English is actually the adaptation of a pre-hispanic Mesoamerican difrasism or semantic couplet, in xochitl in cuicatl (“my flower my song”) in Náhuatl, which reflects an aesthetic conceptualization linking poetry with the natural world as well as entrée into a distinctly non-European set of literary and aesthetic values.